On April 15th, Tea Partiers will protest. What are they protesting? Tax cuts? April 15th marks the first year of the Tea Party Tax Day protests, brought to you by Glenn Beck, Rush Limbaugh, and Rick “Let’s Have a Tea Party” Santelli. The original purpose was to protest “high taxes and big government”. On Thursday, a reprise is scheduled to take place across the country, but I can’t help but wonder exactly what they’re protesting. This page lists the average tax cuts for the nation, and then breaks them down by state. Overall, everyone got a little piece of the tax cut pie this year. In Arizona, home of newly-conservative John McCain and the even more conservative John Kyl, the average combined tax cut was -$1,023. In Oklahoma, that state threatening to declare war on overtaxation, the average tax cut was -$1,098. In Alaska, -$1,096. 98% of working families received a tax cut in this country. Ninety-eight percent. Every state’s average tax cut was similar. So tell me again: What is it they’re protesting? 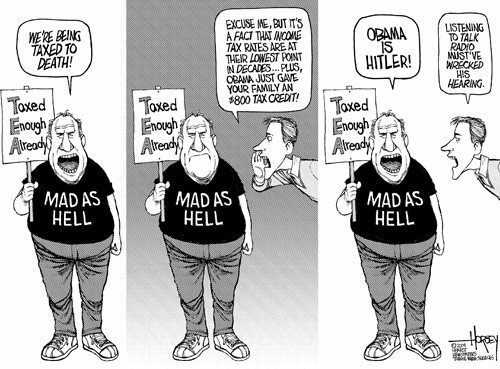 In time for tax day, Citizen for Tax Justice releases a new fact sheet [pdf] on your federal tax bill for 2009. It’s good news, for 98% of working families. According to a recent CBS News/New York Times poll, the vast majority of Americans do not perceive that they have received a tax cut from President Obama. Asked if the President “has already raised taxes this past year,” 53 percent of those polled said that the President has “kept taxes the same,” and 24 percent think that the President has “raised taxes.” A mere 12 percent believe that the President has cut their taxes. An astonishing level of people believe any lie the Republican party tells them. A sizable chunk of them probably still believe that Saddam Hussein was responsible for the 9/11 attacks. Turning around the “tax and spend” stereotype for Democrats is going to take a long time to dislodge. Even more important to dislodge will be the persistent idea that taxes somehow aren’t critical to the functioning of government, of society. At any rate, if you’ve been procrastinating on completing that return, get to it. You might very well have a better outcome than you’ve been expecting. Yo! If you wear Teabags, the truth shall NEVER set you free, because: a) you make up your own facts to fit your twisted ideology, or b) you’re just to stupid to read with understanding, and comprehension or c) you’re just plain stupid. i also think there is some plain ol’ manipulation by their leaders. mass movement leaders on the extreme right don’t care about the truth – take the “death panels” for instance; those politicians who espoused this “evil” knew damn well that they were misleading their flocks.